Is there any way to recover my ICQ password when I lost or forgot it ? I've set his ICQ account to High Security but later I've forgotten the password. Since I had not put any email account in the info, I can't use the password retrieval utility in ICQ's website. Now what should I do in order to use the ICQ account again? 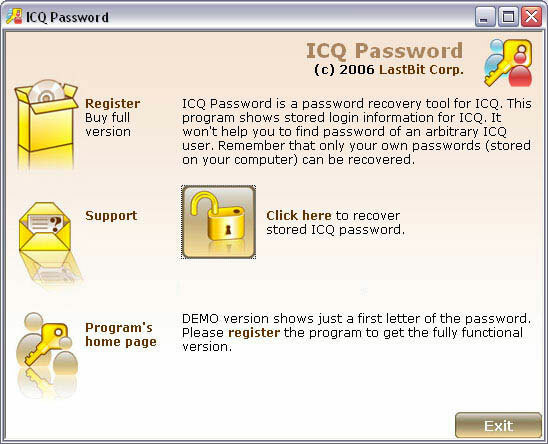 ICQ Password is a password recovery tool (although not a password cracker) that is used to recover lost or forgotten passwords for your ICQ accounts. It is important that the password you are trying to recover is stored on your computer (i.e. you are recovering your own password and not trying to crack someone’s passwords). For all users that are present on the computer the program is launched at, nickname, UIN and password will be retrieved. The program is very simple to use, just launch it, make a few mouse clicks and you will get all information about your ICQ accounts including passwords. You are not required to be a password recovery professional and make it through a lengthy configuration process – ICQ Password works in a fully automatic mode. Even better, you don’t have to wait for hours for the password recovery process to complete. 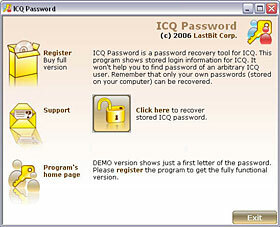 Your ICQ passwords will be recovered instantly! Note: this program is not a hacker tool. It won’t help you to find password of an arbitrary ICQ user. Remember that only your own passwords (stored on your computer) can be recovered.